For my first book, it was the fulfillment of a dream, the culmination of years of work and the validation that I had not been crazy when I’d quit my journalism job to get “serious about writing fiction.” It was also terribly unnerving to know that my baby would now be out there, inviting judgment. I was uncharacteristically touchy the whole day, like a raw nerve. She answered a few questions about her writing process and feelings about her big day for today’s blog. Q. 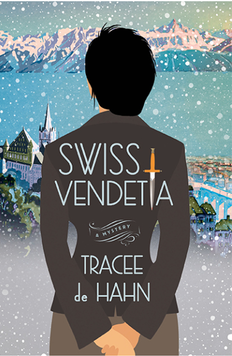 What was your inspiration for writing Swiss Vendetta? A. My husband is Swiss and we lived there for some years. It is a fascinating country. Incredibly beautiful and peaceful and orderly… until you notice the undercurrent of energy expended to keep it that way. The contradiction is fascinating and made me think of the elements of a mystery. There were a few other pieces that had to come together – the winter setting was inspired by the memory of a devastating ice storm some years ago in Geneva. The famous Château de Chillon on the shores of Lac Léman above Lausanne was the inspiration for my Château Vallotton (Lord Byron was also inspired by this location). After I had the location in mind, the plot and characters evolved. The crime at the center of the book came easily. Q. How do you come up with your characters? Are they modeled after people that you know? A. They certainly contain bits of people that I know, but the elements of the individuals are transformed into something wholly of my imagination. For example, one of my favorite characters in Swiss Vendetta is the aging Russian, Vladimir Arsov. His voice, his manner of speaking, and his confidence were all inspired by an Italian architecture professor I had the good fortune to know. Arsov’s life story was all my invention, but the reader will understand how the man’s presence – based on my friend’s – helped created the rest. Q. Do you picture the actress who would play your protagonist in a movie? A. I’ve thought about the cinematographic dimension of the book, but I haven’t thought about the actress who would play Agnes. Hopefully I’ll need to one day. Q. What was the most surprising thing about the book publishing process to you? A. The collegiality of the writing community, particularly those in the mystery and thriller genre. Writing is a solitary endeavor and they make it less so. I imagine that before the internet, authors wrote to one another. Now the immediately of the internet and the growing network of conferences mean that we can connect daily. There is much to be learned and this group is always willing to share. A. A combination of happy and relieved. I know myself too well, and while writing is solitary, a book is a shared experience. I wanted to be out and about at launch time. My publishers lined up a tour of several cities and I’ll be distracted for a few weeks. For the actual launch date, I am signing at one of my favorite book stores, in a city I love – Joseph-Beth Booksellers in Lexington, KY.
A. Finalizing the second in the series and then starting the third! I think that the second is a psychological hurdle. I have a dozen ideas for the next one and hopefully the ones after that. Really, can’t wait to get started!